Last weekend, San Francisco’s world-famous crooked block of Lombard Street saw most of its car traffic disappear as part of a month-long trial, opening the street up for people. The SFMTA’s goal is to eliminate the gridlock caused by tourist drivers who queue up for blocks to cruise down the street. 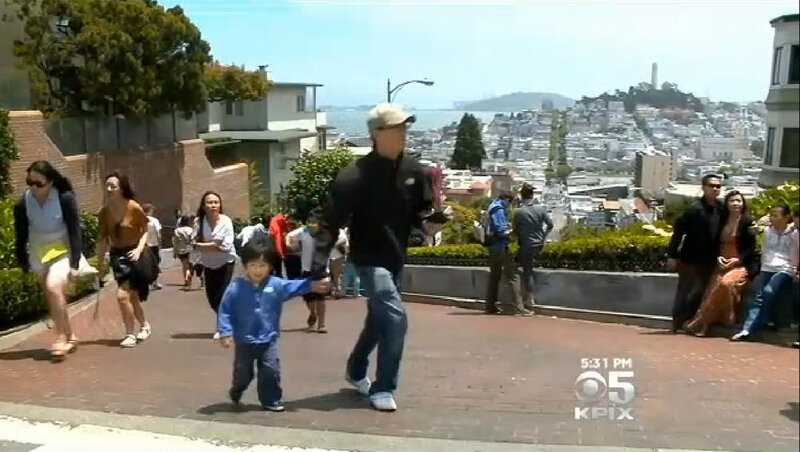 Tourists found a way around Lombard Street’s first weekend closure by walking straight through it. Lombard’s been turned into a pedestrian path. Closing the crookedest street in the world to tourists was supposed to give residents a break, and some privacy. Instead, they got chaos. Thank the heavens we have reporter Brian Webb to expose the atrocity of tourists walking down the middle of Lombard, without fear of cars. To hear it from Webb, these folks are all out-of-control mavericks exploiting a loophole. A really big loophole. Whether this sort of asinine reporting can be attributed to Webb’s inability to understand the purpose of the project, or a newsroom desperate to concoct a controversial narrative to drive ratings, we may never know. The project was never intended to “drive tourists away,” as Webb states. By all other accounts, the trial made Lombard a far more enjoyable attraction for those not in cars — the vast majority of visitors on the street. It went exactly as planned. A few minutes after the road closure signs went up, the crowds of visitors began filling the snaky brick void – strolling, taking photos, enjoying the spacious counterpart to the block’s cramped sidewalks. “This gives us an opportunity to enjoy it more,” smiled Dean Speer, a visitor from Alabama who had strolled over from Fisherman’s Wharf with his daughter, Amanda, and his son, Sam. As we’ve written, unfettered car access is typically equated with “access” in news headlines and our everyday lexicon. 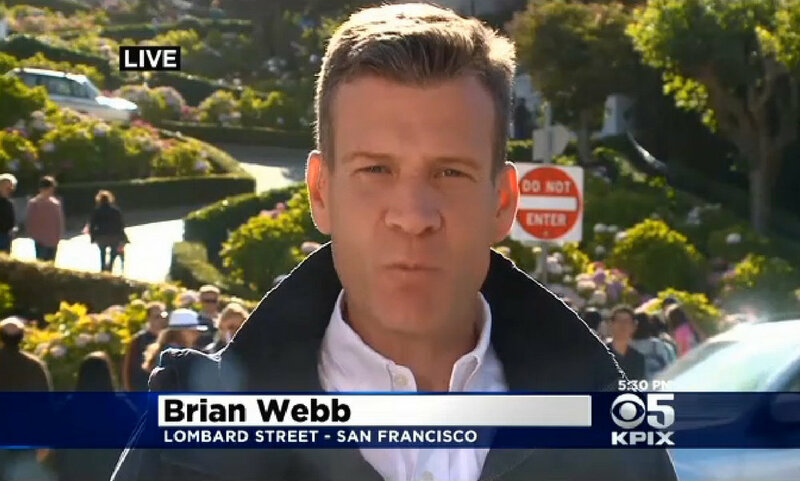 That might explain why KPIX apparently calls the enjoyment of Lombard without cars pandemonium. Webb’s smoking gun appears to be footage of a driver honking at people to clear the way, apparently so he or she can get to their private driveway (since local car traffic is still allowed on the block). A motorist interviewed by reporters called the pilot program “a joke,” even though it was initiated by her neighbors. Oh god no! Not human beings out in the open enjoying a beautiful city without fear of being run over! Won’t someone think of the millionaires who chose to live on a tourist magnet! What is needed is a free/low cost shuttle to move people from the main tourist areas to Hyde and Lombard and then a pickup at Lombard and Leavenworth. I know that it isn’t exactly what the residents wanted, but let’s be real – Lombard Street is never going to be an island of tranquility and people walking down Lombard is WAY better for the resident’s quality of life than people driving. And yes, it is going to be a huge cultural shift to move our lexicon and assessment away from 20th century automobile-centric success measures. We need to build a culture that works to mitigate the negative affects of what is otherwise seen as successes. That’s what happened with the bus ban in Alamo Square. PS: I didn’t see anyone talking about the wealthy-people in Alamo Square who benefited from closing it to busses. It would be good to refrain from talking about the “wealthy people” who live on Lombard, and save those arguments for when we are dealing with the very real issues of income/wealth disparity. And do spend some time there on a weekend; it is easy to see that this isn’t really about wealth. I’m surprised that nobody has died due to emergency vehicles being stuck among the tourists. And no, I don’t live there. I wish I could ride a big wheel down the street while it’s closed to cars. So long as no fights broke out and no one was hit by a taxi or resident car, then things turned out OK.
….the shuttle exists. Its called a cable car. Free with a pass. Let’s spread the chaos! At first I despised the thought of these people trying to privatize a public space, but this may be even better! IMAGINE what would happen if we closed more streets and let people reign. Like Sunday streets x10. And what would happen if we permanently closed a street! Makes you think about taking cars off Market, or even off Powell. Why do we even need to drive around in Union Square?! What would happen…. IMAGINE. Lombard between Hyde and Leavenworth does not allow vehicles over 3-tons. Most of the streets in Russian Hill have the same restrictions. However, the restrictions are never enforced by SFPD because they have more “important” things to worry about, such as forecasting the temperature so they know when to blame the weather for spikes in crime. Hahahaha… I find it truly amazing that people living on Lombard St. – arguably one of the most famous landmarks in the world – complain about the tourists! Folks, the traffic and visitors come with the territory… you don’t get to move in and change the rules because you don’t like them. Last I checked, tourism is one of the most important facets of what makes San Francisco a thriving city. And, the idea of getting people out of their two-ton polluting death traps is a refreshing experience for everyone – residents included. You’re missing the point — they weren’t complaining about tourists, per se, but about the lines of automobiles denying them access to their homes and toxifying the environment they have to live in. This is heaven, by comparison. I think most of North Beach could be easily closed to cars. That’s the kind of chaos I could quickly learn to enjoy. Absolute Chaos at Lombard Street? Plan Backfired? If I put a question mark at the end it’s not considered misleading? I live a few blocks away. It was really quite cool to see all of the people walking on the street and it had more of a carnival feel than usual when cars are inching down it. One consequence of the closure was that parking on the nearby streets was extremely tight and there were far more folks circling looking for parking. Given that there is pretty much no public transit (other than the cable car which is expensive and a bit limited) and there is no parking structure anywhere nearby I agree that a shuttle bus may be a good idea during the closure hours (not a full blown Muni bus line, which the residents would never allow). It also had the consequence of many more tourists strolling around the entire neighborhood on foot (some even walking on the Greenwich St. steps between Leavenworth and Hyde). All in all I think it’s a positive but transportation to the site should be studied and maybe improved. I’ll meet you there with my Green Machine. Every Easter Sunday, the world’s most crooked street (that would be Vermont St) experiences the chaos of little plastic wheels skidding around its corners. If people walking down the middle of a beautiful street is considered chaos, bring it on! Seriously, even if they end up crawling down with the pedestrians, thats better than crawling from 2 blocks away behind a line of cars like they did before. You realize that used to be on Lombard. F’ing children! Why don’t they just get cars if they want to drive on Lombard? Has anyone stopped to think about how the cars feel about this? Won’t somebody please think of the cars? Each of those lines is at least 2.5 blocks away (and the 45 is up a hill on Leavenworth that many tourists wont or can’t climb). I do think the 30 could be used (which is closest and a flatter walk) and should be promoted as such (i.e. a sign at the stop of Lombard or Columbus pointing towards the crooked st. etc.). You and I may know about that particular bus but it isn’t something that tourists know about or are even told about.. Personally, I think it would be just as easy to have a shuttle to Leavenworth/Lombard from Fisherman’s Wharf/Pier 39 during weekend afternoons. Those areas have plenty of tourist parking. Does anyone have a sense of bike access? Are those lumped in with no cars allowed? I wonder if one could claim “local” bike access by convincing the guards that one was visiting a friend on the block… who happened to not be home… 🙂 It’s a fun block to ride down, as long as you lower your seat for the extreme grade. Actually, I get the issue re: long lines of cars blocking the road and driveways… that’s a headache, for sure, but it couldn’t have been a surprise to the residents when they bought their homes. The point I am making centers around the two people (assumed to be residents) who were interviewed and complained about the crowds of people at the time the story was filmed. It seems they should have anticipated the crowds of people, and if they didn’t, then that’s on them. Did I mention this is wonderful? I just Tweeted it and already 10 people have re-tweeted! I think the point of the report was that Lombard is a residential street and that closing it to traffic means that the street will be overwhelmed by tourists on foot. That seems to be what the residents interviewed in the report are complaining about. Some enterprising children should set up a lemonade stand. They might have to actually talk with a tourist. I love talking to tourists as they come here from all over the world! They spend their money and share their culture with us. Why do we allow bikes? I ride bikes; but I know they can be a real threat to pedestrians. The rules for bikes on roads should be the same for cars as this issue is about more than traffic jams. It’s about safety for all.